The ambitious goals set for the future fuel consumption and emission of pollutants for aircraft engines requires the challenge of aircraft engine designs and the aerodynamic optimization of the engine components. This requires a deep physical understanding of the mechanisms reducing the efficiency of the aircraft engine components, which can be achieved by the measurement of the time-resolved entropy production in turbomachines. For the assessment of the entropy production the measurement of the time-resolved total total temperature and total pressure fields is necessary. While the latter is possible with commercialized probes, the former still lacks a robust and valid measurement technique. A new approach for a fast-response total temperature probe has been developed most recently at the Institute of Aircraft Propulsion Systems at the University of Stuttgart. 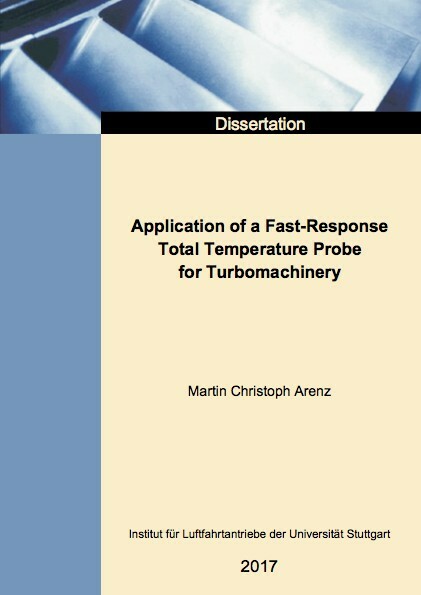 The present work aims towards the application of the newly developed fast-response total temperature probe to a realistic turbomachine environment. The two-stage low-pressure ATRD-turbine operating in the Altitude Test Facility of the Institute of Aircraft Propulsion System is chosen for this. A detailed investigation of the time-resolved total temperature field of the turbine, with and without hot-spots in the turbine inlet, is performed. With this, the experimental results of the new probe are validated. Furthermore, the potential of the probe for the investigation of unsteady loss mechanisms is shown.